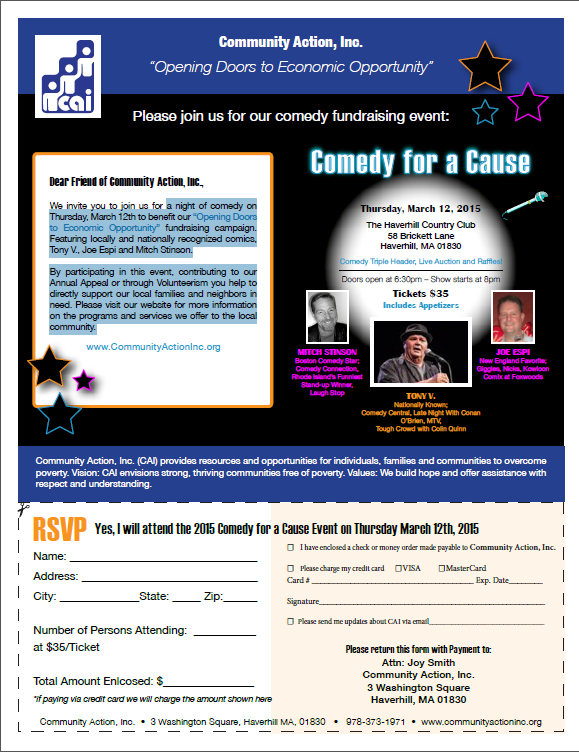 Join Community Action, Inc. on Thursday, March 12, 2015 to watch three top comedians star in a comedy show and fundraising event at the Haverhill Country Club located at 58 Brickett Lane. The doors will open at 6:30 pm for drinks, appetizers and a chance to bid on Celtics tickets, Red Sox tickets which includes a round trip limousine ride to Fenway park, four production passes to a Wheel of Fortune taping at Sony Studios in California, golf foursomes and many other great prizes. The comedy night will benefit Community Action’s “Opening Doors to Economic Opportunity” fundraising campaign. This year’s Comedy Triple Header will kick off at 8 pm and feature nationally and locally recognized comedians: Tony V. (Nationally Known, Comedy Central, Late Night with Conan O’Brien, MTV, Tough Crowd with Colin), Joe Espi (New England Favorite, Giggles, Nicks, Kowloon, Comix at Foxwoods) and Mitch Stinson (Boston Comedy Star, Comedy Connection, Rhode Island’s Funniest Stand-up Winner, Laugh Stop). Tickets are $35 each and include appetizers, a cash bar, many laughs and an opportunity to support Community Action’s mission of providing resources and opportunities to help local families overcome poverty. Community Action supports families through education, advocacy and prevention services in Amesbury, Boxford, Georgetown, Groveland, Haverhill, Merrimac, Newbury, Newburyport, Rowley, Salisbury and West Newbury. To purchase tickets, please go to www.brownpapertickets.com/event/1257783 . For more information, to donate raffle items, or to purchase tickets from CAI, please call 978-373-1971.